To the British motorcycle enthusiast, the "Cammy" Norton is, in its maker's proud slogan, "unapproachable." Created in 1927 as the CSl (Cam Shaft One) by Walter Moore who later designed a similar engine for NSU - and redesigned a few years later by Arthur Carroll, the overhead-camshaft Norton single was refined into its ultimate form by development engineer ]oe Craig. The original 79x100mm SOOcc was joined in 1928 by a 79x88mm 350. The "International" name appeared in 1932 on road-going versions of the works 350 and 500 racers, and in 1939, the International wasgiven a production version of the "Garden gate" frame with plunger rear suspension. Telescopic forks replaced girders in 1948, but the "Inter" was beginnino to look a little longthough it was still a force to be reckoned with in clubman racing. In 1953, it was rejuvenated with the adoption of the celebrated "Featherbed" duplex-loop frame developed by the McCandless brothers of Belfast. Despite this fundamental redesign, the International was no longer the prized over- the-counter club man racer it had been. It had become a fast tourer that was difficult to tell apart from the marque's other models. Indeed, it was no longer featured in the general catalogue, but in the restricted circulation documents relating to the Manx road-racer. By 1958, the Inter was only available by special order and a few months later, it was gone forever. 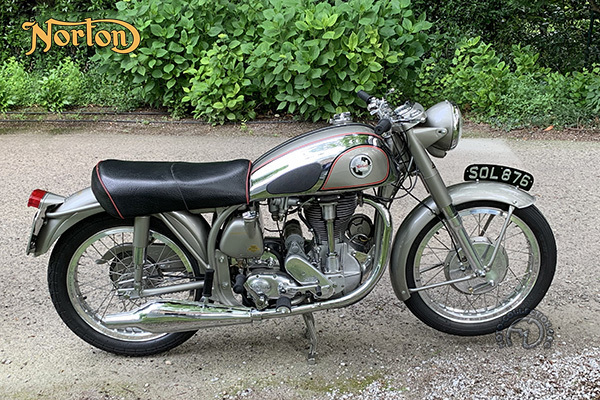 Very similar ·in appearance to the contemporary Dominator 88 and 99 ·models, the final Norton Jntemationals had light-alloy, full-hub brakes.